In 2011, the MarSOC Marine Occupational Specialty (MOS) for the Critical Skills Operator (CSO) was created as an option for those Marines who choose to stay within the Marine Special Operations Command for the remainder of their career. The Critical Skills Operator is a Marine who has screened positively for the Marine Corps Special Operations Command. Once part of the MarSOC command, the Marine also assumes the title of "Raider". Foreign Internal Defense (FID), Direct Action (DA), Special Reconnaissance (SR) and Counter-Terrorism (CT), the Secondary Core Task of Information Operations (IO) and tasks in Support of Unconventional Warfare (UW) as part of the Marine Corps component to SOCOM. MarSOC Marines (Raiders) are capable of rapid deployment and integration into a joint special operations or conventional forces. CSOs are intensively trained as a Subject Matter Expert in advanced communications, engineering, special weapons, intelligence, advanced special operations, and language skills, depending on their billet in the Marine Special Operations Team. All Marines, regardless of MOS, must successfully complete MarSOC Assessment & Selection (A&S), Individual Training Course (ITC) and must request and be granted a lateral move to the 0372 MOS. COMMARFORSOC is the awarding authority for the primary MOS 0372. Must possess a GT score of 105 or higher. Must have a minimum current USMC PFT score of 225 (regardless of age). Must be a volunteer in the grade of Corporal through Staff Sergeant in any MOS. Must have a minimum of 2 years in service and no more than 17 years in service. No derogatory Page 11 entries within the last 12 months. No NJPs within the last 12 months and with no more than two NJPs during the current contract. No NJPs as an SNCO. No incidents with drug use or possession while in service. No adverse fitness reports within the last 12 months. Must have minimum interim secret security clearance based on National Agency check, Law Enforcement and Credit Check (NACLC). MarSOC is a component of the US Special Operations Command (SOCOM) that is a joint group consisting of the Naval Special Warfare Command (SEAL / SWCC), Army Special Operations Command (Special Forces, 75th Rangers, Special Operations Aviation), Air Force Special Operations Command and the Joint Special Operations Command (JSOC). What Is the Difference Between Marine RECON and MarSOC? There are two Special Operations Capable groups of Marine RECON in the USMC: Battalion and Force. For generations, RECON has been the Special Operations Capable units in the Marine Corps. However, shortly after September 11, 2001, the Department of Defense / SOCOM requested of the Marines to create a special operations command to become a component of the Joint Special Operations Command with skilled operators who were highly trained to conduct special operations all over the world. There is a difference between the two RECON units as well. The difference, mainly, is who works for who. The Battalion RECON answer to the Marine Division Commander (typically a Colonel in the USMC). The Force RECON Marines answer to the Air-Ground Marine Task Force Commander who is typically a Major General. They both do battlefield operations but Force can be tasked with "beyond the battlefield" operations behind enemy lines taking the fight to the enemy. 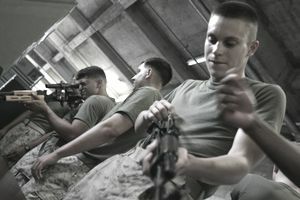 In essence, the Marine RECON units work for the Marine Corps though they may do joint operations with other military branches in larger scale conflicts. MarSOC works for the Special Operations Command which also has component commands such as the Naval Special Warfare Command, Army Special Operations Command, Air Force Special Operations Command, and the Joint Special Operations Command. All tend to work together or independently as needed and as the warfighting climate demands to conduct a variety of missions that include direct action, foreign internal defense, counter-insurgency, intelligence gathering, special reconnaissance, and more depending on SOCOM deployment orders. The MARSOC mission is to recruit, train, sustain, and deploy scalable, expeditionary forces worldwide to accomplish special operations missions assigned by U.S. Special Operations Command (USSOCOM). To accomplish that, MARSOC equips and trains Marines to succeed in austere conditions against a wide range of adversaries.